Download QVGA Movie related homescreens in here! 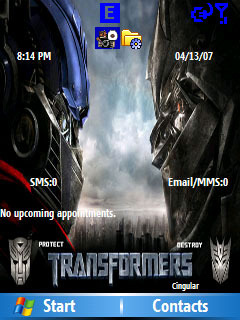 My 3rd homescreen thanks to w4llys tut. This movie is also known as "Cloverfield". PS. 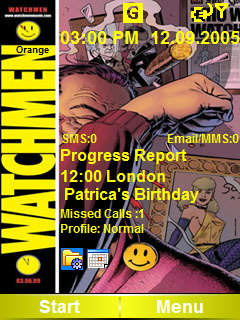 If you like this homescreen and want to know more about the Watchmen, go to your book store or comic book shop, and read up on it. :D A simple animated Babylon 5 homescreen. 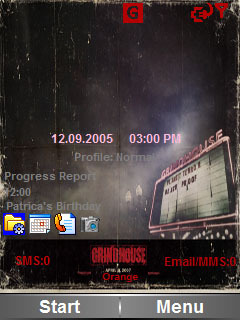 :D This is the LITE version of the "Grindhouse" Homescreen for Windows Mobile 5, QVGA Portrait screens. Please unzip the file and drag and drop the cab file onto your WM5 phone. Read the text, and see the screenshot if you are interested in the "Full" version. :D My second creation, yet my first to post anywhere. I am very new at this, so please excuse any problems. Any kind advice will help for future creations. Thank you. :D My second Battlestar Galactica creation. It looks great on the Cingular 3125. I hope you enjoy it.